Long ago and far away when professional football was played exclusively on Sunday afternoons, the day after the games media outlets and fans would speculate on what the local team could have done differently to improve the result of the previous day’s game. These “Monday morning quarterbacks” would question the judgement of the professionals that the same “quarterbacks” had praised the previous week. “Monday morning quarterbacks” are always right; hindsight is always easier than foresight. Alas, the NFL now plays ball several days a week and living in a democracy means that everyone gets to be a “Monday morning quarterback” on any issue. Leaders are “damned if they do, and damned if they don’t”. President Obama has been the target of numerous critics lately who claim that he should have taken different actions in the Middle East (You know, that area of the world that has yielded so many easy solutions over the centuries! 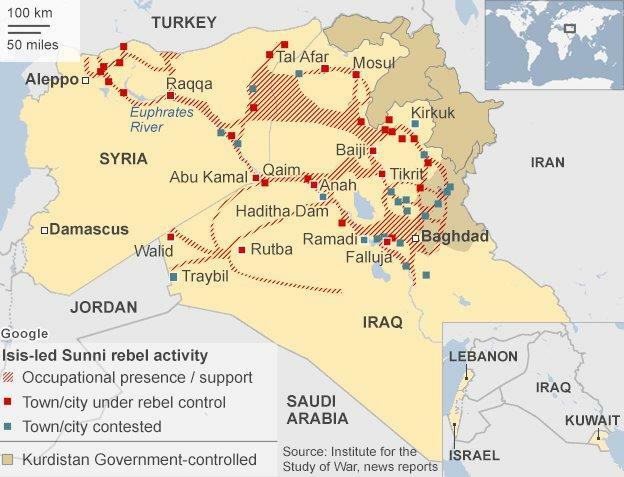 ), especially in regards to Syria and Iraq(see map) . In Syria, the most common complaint is that the US should have armed the moderate Syrian opposition early in the rebellion and then Bashar al-Assad would have been toppled from power. President Obama has responded that given the inexperienced nature of the moderate Syrian rebels, the weapons might have ended up in the hands of Islamist extremist rebels as they clashed over the goals of the rebellion. In retrospect, Mr. Obama has a point; after all, in the recent use of air power to thwart the Islamic State in Iraq, the United States finds itself bombing ITS OWN MILITARY HARDWARE which the Islamic State seized from a professional Iraqi army that the United States military trained! In addition, when it looked like the Syrian rebels might succeed, Hezbollah in Lebanon and the Iranian government were quick to come to the aid of the Alawite Shiite Assad. I am not sure overthrowing Mr. Assad was in the cards unless the US was willing to hazard more direct involvement. Though I do believe Mr. Obama should have backed up his “red line” threat with something, like taking out every Syrian airfield or establishing a “no fly” zone. At least we have eliminated Syria’s chemical weapons stockpile, it seems, and that is something. As for Iraq, the complaint is that Mr. Obama did not leave US troops in the country and did not try hard enough to negotiate the “status-of-forces” agreement that the US concludes EVERY TIME it stations troops in a foreign county. Status-of-forces agreements or SOFA’s (love that acronym) ensure that our soldiers are not subject to whimsical foreign legal systems if they get into trouble in a foreign country. Of course the “Monday morning quarterbacks” neglect to mention that when you “liberate” a country and give it a chance at democracy, if they decide not to want your presence, you don’t get to stay. I have not seen evidence that Nouri al-Maliki, the recently departed Shiite leader of Iraq, was serious about concluding the status-of-forces agreement. Conservatives have recently tried to blame the rise of the Islamic State in Iraq on Mr. Obama and claim that he was never serious about finalizing a SOFA. Now it is obvious that Mr. Obama campaigned in 2012 on his ending the war in Iraq, and maybe he wanted to be able to use that claim in his campaign. But it is also true that Mr. al-Maliki and the Shiite majority parties in Iraq wanted the US out in 2011. These Iraqi “democratic” politicians had read the Iraqi polls of 2011 that overwhelmingly wanted the US presence and its humiliating overtones gone from their country. I am not sure the conservative “quarterbacks” from the National Review or Weekly Standard recognize that fact. I did believe that Mr. Obama should have taken advantage of Iraqi’s open, desert terrain to use drones to take out some of the ISIS fighters back in June. After all, we have gone after similar threats in Pakistan, Yemen and Somalia in the past. But I also have to admit that Mr. Obama’s refusal to have the US air force be the “Iraqi air force” put pressure on Iraqi politicians, especially Shiite allies and rivals of Mr. al-Maliki, that led to his departure as prime minister last week. Now Iraq may have a chance to survive as a country, though that still looks like a long shot. It always feels good for humans to have their countries and governments “attack”! Remember that internationally renowned Robert E. Lee, the Confederacy’s genius general was derided as “Granny Lee” when he decided to dig trenches and play defense. We feel like we have more control when we humans take the action to the enemy. When we “charge”! But remember the sick feeling and even horror after our troops charged into Iraq and got ambushed and blindsided a decade ago. I have been very frustrated by Mr. Obama’s lack of leadership in domestic policy, and that is another story. But given the desire on the part of much of the American public for their president to focus on domestic matters and avoid foreign adventures, I am not sure we can blame Mr. Obama as much as his conservative critics reflexively do. The situations in the Middle East are extraordinarily complex; maybe the Monday morning quarterbacks should appreciate that constantly throwing “Hail Mary” long bombs might only make situations worse.